We’d love your help. Let us know what’s wrong with this preview of State of Allegiance by Summer Lane. Be brave. Be vigilant. But above all, be loyal. To ask other readers questions about State of Allegiance, please sign up. I've read this at least 7 times already, but don't worry - I'll read it again and again before publication! SO EXCITED about this installment. Thanks for the support, readers. Looking forward to February 24, 2017! This series has been such a rollercoaster, and book nine does not disappoint! This might be my favorite installment since the first three. 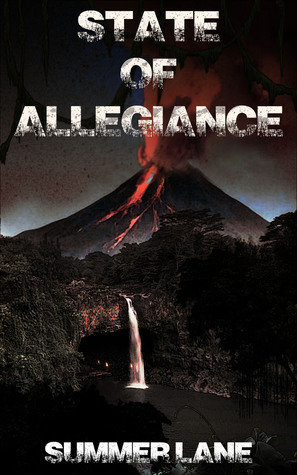 While I have enjoyed each book in the Collapse series, I felt like the last few books we lost a little bit of Cassidy and Chris, and State of Allegiance gives us their connection and banter once again. I don't feel I can do this review justice without giving away important parts of the story, but it is full of everything we love about Collapse. Chris, Cassidy and their team have come so far and have gone to the extreme to fight Omega, and State of Allegiance not only takes you on a heart pounding adventure against Omega forces, but gives us a new setting, and new evils to battle. Emotional, intense, action packed, and a nasty cliffhanger ending have me waiting impatiently for book 10 and the conclusion of Collapse. Clearly if you are reading book nine, you have enjoyed books 1-8 as much as I have, and Summer Lane does it again with this one. I highly suggest reading Unbreakable Seal prior to reading State of Allegiance. It gives Chris so much depth and allows us a glimpse of what he was, who he is, and why he is so pinnacle to this fight. I was provided an ARC for an honest review. It's hard to review the book without giving too much away. It's packed full of new twists and turns. And of course Omega. This book had me happy, sad and nearly down right crying. Honestly if your reading this your a reader of this series and you must read this 9th instalment. I'm dying to get my hands on the 10th because it was left on such an emotional cliffhanger. Summer has knocked it out of the park again! Definitely a 5 star read! This series just keeps getting better and better. Summer Lane has kept her characters true to their original "selves" yet they also keep growing and solidifying. I feel like I am a part of the story and action, that the characters are my friends and cohorts. An amazing author and storyteller! Cannot wait for the next book!! I cannot say enough good things about this series in its entirety. I am hanging by a thread wondering how this is going to end. I have read the entire State of series. I enjoyed the way the characters are developed, as they grow and fight for freedom and their homeland. Can't wait for the next one. An here we wait for the next book. Love the hole series great reading. Love it. I try hard to stretch it out but before I know it it's the end. Summer Lane is the #1 bestselling author of 23 hit books, including the smash-hit Collapse Series. The final installment of the series, STATE OF HOPE, released June 2017. Summer is also the author of the bestselling adventures of the Zero Trilogy, Bravo Saga, Unbreakable SEAL, Collapse: The Illustrated Guide, and Vigilante. Running with Wolves (historical thriller) was released September 22, 2017. Summer Lane is the #1 bestselling author of 23 hit books, including the smash-hit Collapse Series. The final installment of the series, STATE OF HOPE, released June 2017. Summer is also the author of the bestselling adventures of the Zero Trilogy, Bravo Saga, Unbreakable SEAL, Collapse: The Illustrated Guide, and Vigilante. Running with Wolves (historical thriller) was released September 22, 2017. Resurrection: Shadows of Omega, the first story in a continuation of Cassidy Hart's adventures, launched February 2018, which has been followed by consecutive series installments ever since! She released the non-fiction guide to writing, Prolific: Writing A Hit Novel, July 12, 2018.